While Theravada Buddhism remains the dominant religion in Myanmar, Islam and Christianity have grown significantly in recent years. 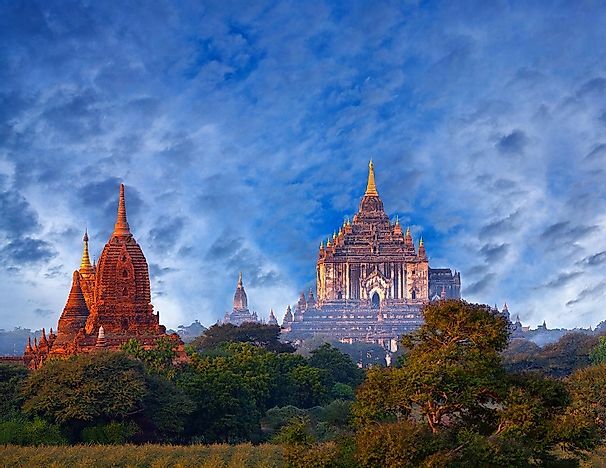 Theravada Buddhist temples in Myanmar's Bagan Archaeological Zone, some of which date back almost 1,000 years. Myanmar is a country in Southeastern Asia bordering the Andaman Sea and the Bay of Bengal. It lies between Bangladesh and Thailand in Asia. The country is often referred to in the Western World as Burma. Myanmar was under the rule of the military and repressive regime following 1962. However, in 1988 the socialist constitution of 1974 was suspended. Myanmar now enjoys freedom of religion. However, there is a limit at which the government tolerates extreme activities by the different faiths, and there have been reports on persecution of the minority religions by the government. Buddhism is the most dominant religion with 89.20%. Christianity and Islam have been growing significantly in the recent years. The majority of Myanmar practices Theravada Buddhism, which they consider as a path to follow rather than a faith in the Western sense of religion. The religion began in India around 2,500 years ago when an Indian prince by the name Siddhartha Gautama left the prestigious life to wander as a poor man. His meditation made him reach a state free from world desires. The religion contains four noble truths which include suffering. Buddhism teaches love and kindness for one another and advocates for avoiding the extremes while stressing on good deeds. Buddhism believes in reincarnation and considers that the present actions will affect future life after death. Buddhism influences the society to conserve the environment as it deems nature sacred. A good reason for this belief is that Buddha died under a tree. However, the majority of Buddhists still hold their animistic beliefs, that non-living things have spirits as well. Christianity has held a place in Myanmar since the 18th Century. The first Christians in the country were Portuguese soldiers and a few traders. Missionaries played a prominent role in establishing religion in the country. There was a significant consolidation of the church in Lower Burma among the minorities between the 1850s and 1880s. The main denominations in the Myanmar include Roman Catholicism, Protestantism, and Orthodox. Christians are alleged to have suffered persecution and discrimination making them miss leadership positions in the country. However, there have been acceptance of foreign organizations doing humanitarian work in the country. Christianity has influenced education by sponsoring educational institutions and offering theological education. Christianity in the country constitute 6.2% of the total population. Burma has had Muslim influences since the 11th Century, and the first known Muslim there was an Indian sailor named Byat Wi, arriving in the area around 1050 A.D. Restrictions on many Muslim practices started in 1559. In the 17th Century, there was a massacre of Indian Muslims in Arakan. There are two groups of Muslims in the country the Burmese and Indian Muslims. There has been evidence of discrimination against the Muslims, and there have been cases of riots as a result of this. Ethnic groups such as the Rohingya have had to flee due to disputes from Buddhist communities. Despite this, it has led to more followers joining it in the recent time. Islam constitutes 4.3% of the total population in the country. Hinduism is another ancient religion of Myanmar. The religion believes in Trinity where there are three deities. There are also other gods and goddesses that people worship for their needs. There are forms of meditation that its follower's practice. There are Hinduism aspects that are unique to Myanmar culture practices such as the worship of Thagyamin that originate from the Indra, a Hindu god. The Hinduism constitutes 0.5% of the total population in the country. Besides these religions there are other minor different folk religions and atheist all making up 1.1% of the country’s population.